What does destiny have in store for a teenager unable to express his feelings for the girl of his dreams as their paths keep crossing through the years? Sid turns to work and alcohol to get over the pain of losing Sheetal till she walks back into his arms in the after-party of a corporate awards function. Is she back for good? What does an advertisement on a billboard try to tell a man who has lost his memory and his wife in a near fatal accident? As Riya nurses her broken heart, she meets a stranger on the Internet and finds herself irresistibly drawn to him. Will she find love again? 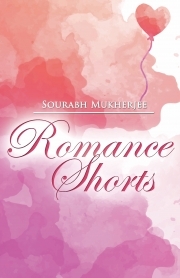 Ranked at #4 among top 12 romantic books by Indian authors in 2016 in an online poll conducted by SalisOnline.com and receiving accolades from readers and the blogger community, 'Romance Shorts' is a collection of four contemporary romantic stories. A brisk read with a lasting impact, it paints love in its various hues, taking us on a soulful journey as we relive loves lost or found or nurtured unspoken in the deepest recesses of our hearts. Sourabh Mukherjee works in a senior leadership position in a leading consulting and technology services firm. He won the Golden Pen Award in Sulekha Monsoon Romance Contest 2014. His debut novel "In the Shadows of Death" published by Srishti Publishers and Distributors is one of the top selling psychological thrillers in India, and has been applauded by readers, bloggers and the national media. Sourabh loves travelling, is an avid reader, and is passionate about photography, movies and music.